Tuesday March 5, 2019-New details have emerged over the monthly salaries of Kenya Airways Chief Executive Officer, Sebastian Mikosz and chairman, Michael Joseph. 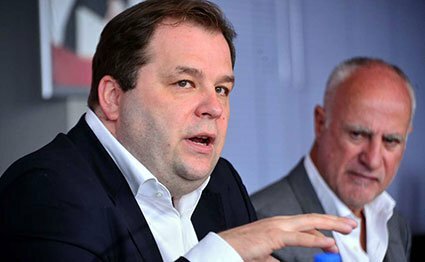 Despite Kenya Airways making loses every day , Sebastian Mikosz, is paid a monthly salary of Sh 7.5 million while Michael Joseph, who is former Safaricom CEO is paid Sh 3 million a month. This was revealed by veteran journalist, David Makali, who termed Sebastian and Joseph‘s salaries as public theft of public money. “Whaaaaat? So Sebastian, the expatriate Polish MD of the insolvent loss making @KenyaAirways that wants to take over KAA earns a whopping Sh7.5million per month and the chairman Sh3m. What is wrong with this country?," Makali wrote on social media on Tuesday..
Last year, Kenya Airways reported a Sh 4 billion loss. When announcing the loss, Mikosz, who is a polish national, singled out fuel price volatility as main challenge. “Our loss before tax is down by 30 percent. We keep slowly but steadily improving,” Mikosz said. I really pity the board of Kenya Airways for first to be so stupid in picking a fat Polish pig as CEO and second in agreeing to pay such high salary to someone who only deserves to be roasted and served as BBQ pork on buffet table. The fat Polish pig Sebastian Mikosz is worthless. He is the most incompetent, stupid, rude, arrogant and selfish person you can find in this world. Sebastian Mikosz was so hated by all the employees at LOT Polish airlines. The board of Kenya Airways is all blind.